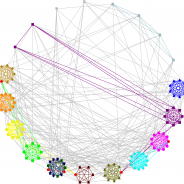 Home Posts Tagged "social network analysis"
I have just read an intriguing paper by Carron and Kenna entitled the ‘Universal properties of mythological networks‘. 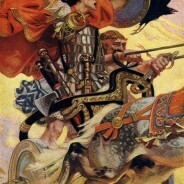 In it they analyse the character networks in three ancient stories, Beowulf , the Iliad and the Irish story Táin Bó Cuailnge. 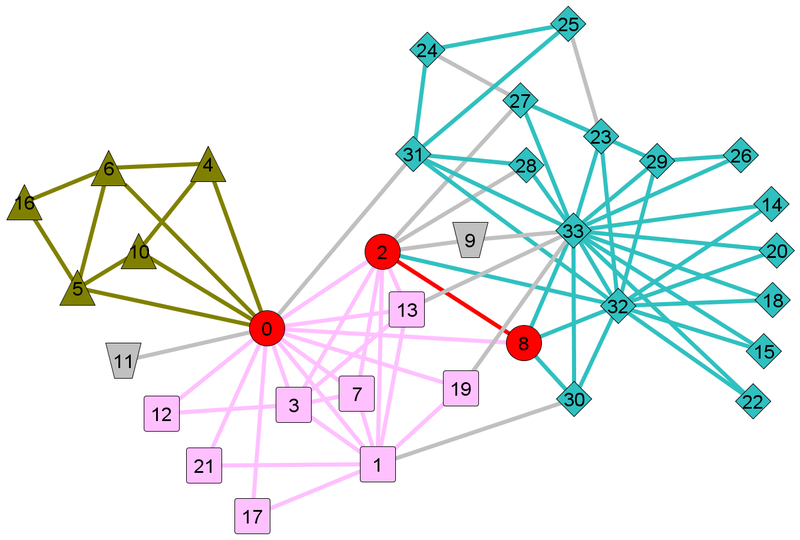 That is the characters form the nodes of a network and they are connected if they appear together in the same part of the story. It has caused quite a bit of activity. It has prompted two posts on The Networks Network already and has even sparked activity in the UK newspapers (see John Sutherland writing in the Guardian Wednesday 25 July 2012 and the follow up comment by Ralph Kenna one of the authors). Well summer is the traditional silly season for newspapers. However I think it is too easy to dismiss the article. I think Tom Brugmans posting on The Networks Network has it right that “as an exploratory exercise it would have been fine”. I disagreed with much in the paper, but it did intrigue me and many papers fail to do even this much. So overall I think it was a useful publication. I think there are ideas there waiting to be developed further. I like the general idea that there might be some information in the character networks which would enable one to say if it was based on fact or was pure fiction. 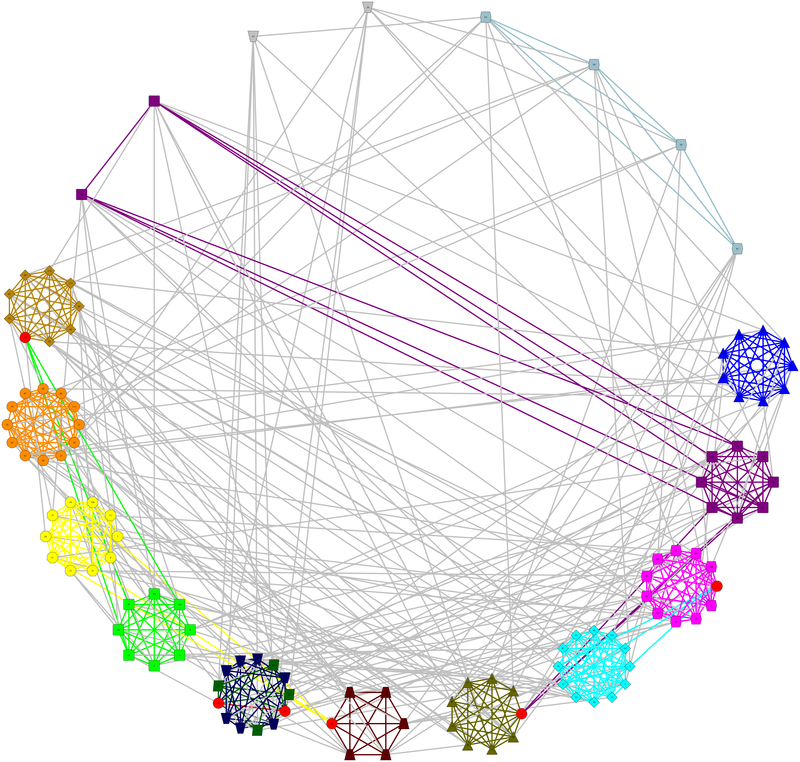 That is if the character networks have the same characteristics as a social network it would support the idea that it was based on historical events. I was intrigued by some of the measures suggested as a way to differentiate between different types of literary work. However like both Tom Brugmans and Marco Büchler, I was unconvinced the authors’ measures really do the job suggested. I’d really like to see a lot more evidence from many more texts before linking a particular measurement to a particular feature in character networks. For instance Carron and Kenna suggest that in hierarchical networks for every node the degree times the clustering coefficient is a constant, eqn (2). That is each of your friends is always connected to the same (on average) number of your friends. 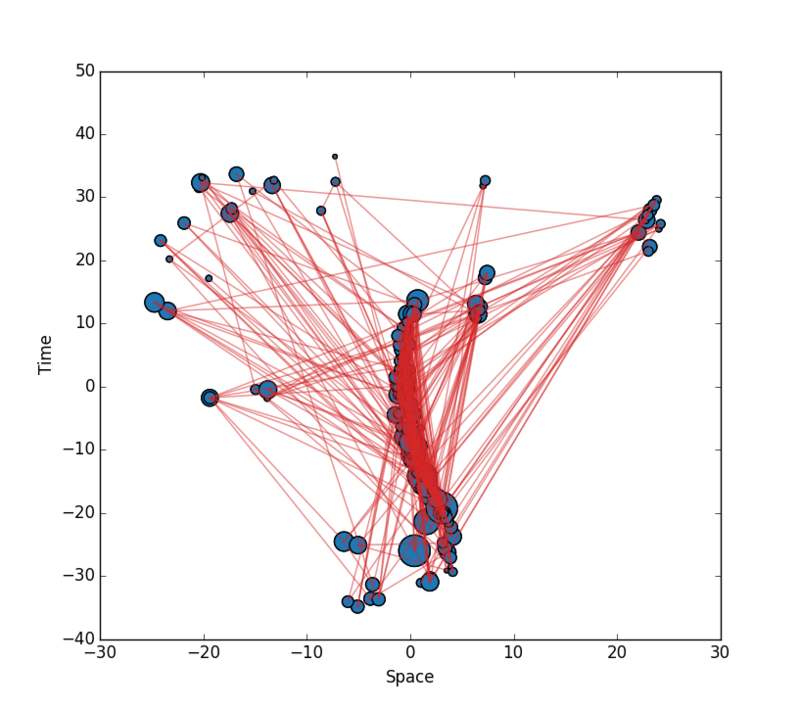 By way of contrast, in a classical (Erdos-Reyni) random graph the clustering coefficient is a constant. However I don’t see that as hierarchical but an indication that everyone lives in similar size communities, some sort of fiction character Dunbar number. I’m sure you could have a very flat arrangement of communities and get the same result. Perhaps we mean different things by hierarchical. Another claim was that in collaboration networks less than 90% of nodes are in the giant component. The Newman paper referred to is about scientific collaboration derived from coauthorships which is very different from the actual social network of scientists (science is not done in isolation no one is really isolated). I’m not sure the Newman paper tells us anything about character structure in fictional or non-fictional texts. I can not see why one would introduce any set of characters in any story (fictional or not) who are disconnected from the rest. Perhaps some clever tale with two strands separated in time yet connected in terms other than social relationships (e.g. through geography or action) – David Mitchell’s “Cloud Atlas” comes to my mind - but these are pretty contrived structures. I think a real problem in the detail of the paper, as Marco Büchler points out, is that these texts and their networks are just too small. There is no way one can talk rigorously about power laws, and certainly not to two decimal place accuracy. I thought Michael Stumpf and Mason Porter’s commentary (Critical Truths about Power Laws) was not needed since every one knew the issues by now (I don’t in fact agree with some of the interpretation of mathematical results in Stumpf and Porter). Perhaps this mythological networks paper shows I was wrong. At best power law forms for small networks (and small to me means under a million nodes in this context) give a reasonable description or summary of fat tailed distributions found here but many other functional forms will do this too. I see no useful information in the specific forms suggested by Carron and Kenna. Another point raised in the text was the idea that you could extract subnetworks representing `friendly’ social networks. That is interesting but really they are suggesting we need to do a semantic analysis of the links in the text, indicating where links are positive or negative (if they are that simple of course) and form signed networks (e.g. see Szell et al. on how this might be done on a large scale http://arxiv.org/abs/1003.5137). I think that is a much harder job to do in these texts than the simple tricks used here suggest but it is an important aspect in such analysis and I take the authors’ point. 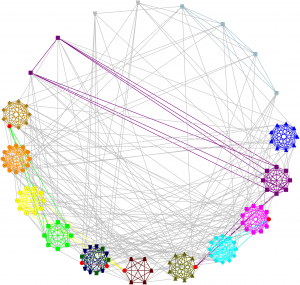 Finally I was interested that they mention other character networks derived from five other fictional sources. I always liked the Marvel comic character example for instance (Alberich et al, http://arxiv.org/abs/cond-mat/0202174) as it showed that while networks were indeed trendy and hyped (everything became a network) there was often something useful hiding underneath and trying to get out in even the most bizarre examples. However what caught my eye in the five extra examples mentioned by Carron and Kenna was that they treated these five as ‘fictional literature’. One, Shakespeare’s Richard III, is surely a fictionalised account of real history written much closer to the real events and drawing on `historical’ accounts. I’d would have expected it to show the same features as they claim for their three chosen texts. So I was intrigued and in that sense that always makes a paper/talk worthwhile to me. However while I was interested I’d need to see much more work on the idea. You might try many different tests and measurements and see if they cumulatively point in one direction or another – I imagine a PCA type plot showing different types of network in tight clusters in some `measurement’ space. I’d still need convincing on a large number of trial texts. These do now exist though, so surely there is a digital humanities project here? Or is it already happening somewhere?